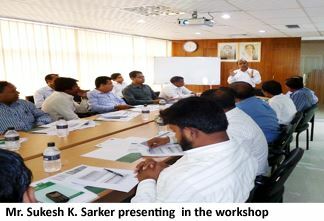 The PPP Office organized a workshop session for PPP Focal Points at different government agencies as part of a continuous series of capacity building events on 8 May 2014. The workshop formed part of PPP Office program to ensure wide dissemination of PPP information and activities to public sector stakeholders. The objective of this workshop was to sensitize the PPP Focal Points on the latest PPP progress and achievement in the country. The workshop also aimed to develop capacity to the participants on advanced PPP project development and transaction issues. Md. Abul Bashar, Deputy Manager (PPP Office) welcomed the participants at the inaugural session. He highlighted the emphasis that the PPP Office has given for the capacity development of the Focal Points. It was essential for all Focal Points to have a strong understanding of PPP as they would act as the key points of contact within their organizations on PPP matters. Three different sessions were conducted from different speakers from the PPP Office. 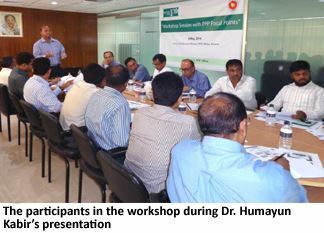 Dr. Humayun Kabir, Deputy Manager, presented the overview of PPP activities in Bangladesh. He described the various phases and activities that led to the recent PPP momentum in the country. Mr. Sukesh Kumar Sarker, Deputy Manager described the process and procedure for project development and transaction stages that a PPP project undergoes. The final session was led by Mr. Syed Afsor H. Uddin, Chief Executive Officer who provided an overview of the PPP achievements in the country. He also described some new proposed projects from various agencies and suggested the way forward to deal with them. The event was concluded with a question and answer session where the presenters responded to issues and queries raised by the participants providing various examples and case studies.